Surface must be clean, dry and free from all surface contamination. Where applicable, fill cracks with a suitable filler then sand and dust surface down. 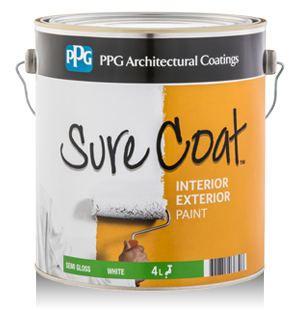 Prime and or undercoat surfaces with appropriate products as required. Remove all loose and flaking paint by scraping or sanding previously painted areas and sand smooth. Surfaces must be clean, dry and free from all surface contamination. If mould is present, treat with bleach then rinse clean with fresh water. Spot prime bare areas with a suitable primer or undercoat. If painting over enamel surfaces, sand thoroughly and apply one coat of oil based undercoat or other suitable product to promote inter-coat adhesion. Apply two liberal coats by brush, roller or spray. Do not overspread. Keep brushes and rollers working freely by rinsing occasionally in clean water. Scrape excess paint from equipment into a separate container. Wash up with water. Do not dispose of paint or wash water in drains or sewers. Avoid exposure to steam for 48 hours. Recoat after 2 hours at 25°C and 50% relative humidity. Stir paint with a 25mm wide flat stirrer in a circular lifting motion for at least 5 minutes before use. It is always recommended to stir paint before use to ensure that the colour tints are dispersed evenly throughout the paint. Do not use at temperatures below 10°C, above 35°C or when humidity is excessive. Look for PPG industrial Coatings?